This article is about the nationalised railway service which existed from 1948 to 1997. For an overview of current rail transport in Great Britain, see Rail transport in Great Britain. For a historic overview, see History of rail transport in Great Britain. British Railways (BR), which from 1965 traded as British Rail, was the state-owned company that operated most of the overground rail transport in Great Britain between 1948 and 1997. It was formed from the nationalisation of the "Big Four" British railway companies and lasted until the gradual privatisation of British Rail, in stages between 1994 and 1997. Originally a trading brand of the Railway Executive of the British Transport Commission, it became an independent statutory corporation in 1962 designated as the British Railways Board. The period of nationalisation saw sweeping changes in the national railway network. A process of dieselisation and electrification took place, and by 1968 steam locomotion had been entirely replaced by diesel and electric traction, except for the Vale of Rheidol Railway (a narrow-gauge tourist line). Passengers replaced freight as the main source of business, and one third of the network was closed by the Beeching Axe of the 1960s in an effort to reduce rail subsidies. On privatisation, responsibility for track, signalling and stations was transferred to Railtrack (which was later brought under public control as Network Rail) and that for trains to the train operating companies. The British Rail "double arrow" logo is formed of two interlocked arrows showing the direction of travel on a double track railway and was nicknamed "the arrow of indecision". It is now employed as a generic symbol on street signs in Great Britain denoting railway stations, and as part of the Rail Delivery Group's (RDG) jointly-managed National Rail brand is still printed on railway tickets. The rail transport system in Great Britain developed during the 19th century. After the grouping of 1923 under the Railways Act 1921, there were four large railway companies, each dominating its own geographic area: the Great Western Railway (GWR), the London, Midland and Scottish Railway (LMS), the London and North Eastern Railway (LNER) and the Southern Railway (SR). During World War I the railways were under state control, which continued until 1921. Complete nationalisation had been considered, and the Railways Act 1921 is sometimes considered as a precursor to that, but the concept was rejected. Nationalisation was subsequently carried out after World War II, under the Transport Act 1947. This Act made provision for the nationalisation of the network, as part of a policy of nationalising public services by Clement Attlee's Labour Government. British Railways came into existence as the business name of the Railway Executive of the British Transport Commission (BTC) on 1 January 1948 when it took over the assets of the Big Four. There were also joint railways between the Big Four and a few light railways to consider (see list of constituents of British Railways). Excluded from nationalisation were industrial lines like the Oxfordshire Ironstone Railway. The London Underground – publicly owned since 1933 – was also nationalised, becoming the London Transport Executive of the British Transport Commission. The Bicester Military Railway was already run by the government. The electric Liverpool Overhead Railway was also excluded from nationalisation. The Railway Executive was conscious that some lines on the (then very dense) network were unprofitable and hard to justify socially, and a programme of closures began almost immediately after nationalisation. However, the general financial position of BR became gradually poorer, until an operating loss was recorded in 1955. The Executive itself had been abolished in 1953 by the Conservative government, and control of BR transferred to the parent Commission. 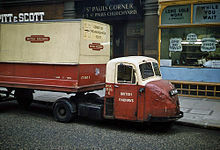 Other changes to the British Transport Commission at the same time included the return of road haulage to the private sector. Southern Region: former Southern Railway lines. Western Region: former Great Western Railway lines. London Midland Region: former London Midland and Scottish Railway lines in England and Wales. Eastern Region: former London and North Eastern Railway lines south of York. North Eastern Region: former London and North Eastern Railway lines in England north of York. Scottish Region: all lines, regardless of original company, in Scotland. The North Eastern Region was merged with the Eastern Region in 1967. In 1982, the regions were abolished and replaced by "business sectors", a process known as sectorisation. The Anglia Region was created in late 1987, its first General Manager being John Edmonds, who began his appointment on 19 October 1987. Full separation from the Eastern Region – apart from engineering design needs – occurred on 29 April 1988. It handled the services from Fenchurch Street and Liverpool Street, its western boundary being Hertford East, Meldreth and Whittlesea. The government appeared to endorse the 1955 programme (costing £1.2 billion), but did so largely for political reasons. This included the withdrawal of steam traction and its replacement by diesel (and some electric) locomotives. Not all the modernisations would be effective at reducing costs. 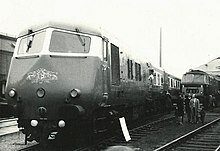 The dieselisation programme gave contracts primarily to British suppliers, who had limited experience of diesel locomotive manufacture, and rushed commissioning based on an expectation of rapid electrification; this resulted in numbers of locomotives with poor designs, and a lack of standardisation. At the same time, containerised freight was being developed. The marshalling yard building programme was a failure, being based on a belief in the continued viability of wagon-load traffic in the face of increasingly effective road competition, and lacking effective forward planning or realistic assessments of future freight. A 2002 documentary broadcast on BBC Radio Four blamed the 1950s decisions for the "beleaguered" condition of the railway system at that time. During the late 1950s, railway finances continued to worsen, whilst passenger numbers grew after restoring many services reduced during the war, and in 1959 the government stepped in, limiting the amount the BTC could spend without ministerial authority. A White Paper proposing reorganisation was published in the following year, and a new structure was brought into effect by the Transport Act 1962. This abolished the Commission and replaced it by several separate Boards. These included a British Railways Board, which took over on 1 January 1963. Following semi-secret discussions on railway finances by the government-appointed Stedeford Committee in 1961, one of its members, Dr Richard Beeching, was offered the post of chairing the BTC while it lasted, and then becoming the first Chairman of the British Railways Board. A major traffic census in April 1961, which lasted one week, was used in the compilation of a report on the future of the network. This report—The Reshaping of British Railways—was published by the BRB in March 1963. The proposals, which became known as the "Beeching Axe", were dramatic. A third of all passenger services and more than 4,000 of the 7,000 stations would close. Beeching, who is thought to have been the author of most of the report, set out some dire figures. One third of the network was carrying just 1% of the traffic. Of the 18,000 passenger coaches, 6,000 were said to be used only 18 times a year or less. Although maintaining them cost between £3m and £4m a year, they earned only about £0.5m. Most of the closures were carried out between 1963 and 1970 (including some which were not listed in the report) while other suggested closures were not carried out. The closures were heavily criticised at the time, and continue to be controversial. A small number of stations and lines closed under the Beeching programme have been reopened, with further reopenings proposed. A second Beeching report, "The Development of the Major Trunk Routes", followed in 1965. This did not recommend closures as such, but outlined a "network for development". The fate of the rest of the network was not discussed in the report. The basis for calculating passenger fares changed in 1964. In future, fares on some routes—such as rural, holiday and commuter services—would be set at a higher level than on other routes; previously, fares had been calculated using a simple rate for the distance travelled, which at the time was 3d per mile second class, and 4½d per mile first class (equivalent to £0.25 and £0.37 respectively, in 2018). Passenger levels decreased steadily from 1962 to the late 1970s, and reached a low in 1982. 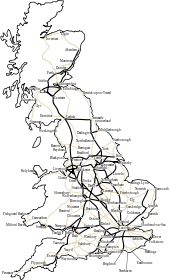 Network improvements included completing electrification of the Great Eastern Main Line from London to Norwich between 1976 and 1986 and the East Coast Main Line from London to Edinburgh between 1985 and 1990. A main line route closure during this period of relative network stability was the 1500 V DC-electrified Woodhead Line between Manchester and Sheffield: passenger service ceased in 1970 and goods in 1981. The 1980s and 1990s saw the closure of some railways which had survived the Beeching Axe a generation earlier, but which had seen passenger services withdrawn. This included the bulk of the Chester and Connah's Quay Railway in 1992, the Brierley Hill to Walsall section of the South Staffordshire Line in 1993, while the Birmingham to Wolverhampton section of the Great Western Railway was closed in three phases between 1972 and 1992. A further British Rail report, from a committee chaired by Sir David Serpell, was published in 1983. The Serpell Report made no recommendations as such, but did set out various options for the network including, at their most extreme, a skeletal system of less than 2000 route km. This report was not welcomed, and the government decided to quietly leave it on the shelf. Meanwhile, BR was gradually reorganised, with the regional structure finally being abolished and replaced with business-led sectors. This process, known as "sectorisation", led to far greater customer focus, but was cut short in 1994 with the splitting up of BR for privatisation. Upon sectorisation in 1982, three passenger sectors were created: InterCity, operating principal express services; London & South East (renamed Network SouthEast in 1986) operating commuter services in the London area; and Provincial (renamed Regional Railways in 1989) responsible for all other passenger services. In the metropolitan counties local services were managed by the Passenger Transport Executives. Provincial was the most subsidised (per passenger km) of the three sectors; upon formation, its costs were four times its revenue. Because British Railways was such a large operation, running not just railways but also ferries, steamships and hotels, it has been considered difficult to analyse the effects of nationalisation. During the 1980s British Rail ran the Rail Riders membership club aimed at 5- to 15-year-olds. Prices rose quickly in this period, rising 108% in real terms from 1979 to 1994, as prices rose by 262% but RPI only increased by 154% in the same time. Following nationalisation in 1948, British Railways began to adapt the corporate liveries on the rolling stock it had inherited from its predecessor railway companies. Initially, an express blue (followed by GWR-style Brunswick green in 1952) was used on passenger locomotives, and LNWR-style lined black for mixed-traffic locomotives, but later green was more widely adopted. Development of a corporate identity for the organisation was hampered by the competing ambitions of the British Transport Commission and the Railway Executive. The Executive attempted to introduce a modern, curved logo which could also serve as the standard for station signage totems. Due to its similarity to a hot dog, it became known as the "flying sausage". BR eventually adopted the common branding of the BTC as its first corporate logo, an Art Deco-style motif of a lion astride a spoked wheel, designed for the BTC by Cecil Thomas; on the bar overlaid across the wheel, the BTC's name was replaced with the words "British Railways". This logo, nicknamed the "Cycling Lion", was applied from 1948 to 1956 to the sides of locomotives, while the sausage logo was adopted for station signs across Great Britain, each coloured according to the appropriate BR region. In 1956, the BTC was granted a heraldic achievement by the College of Arms and the Lord Lyon, and then BTC chairman Brian Robertson wanted a grander logo for the railways. BR's second corporate logo (1956–1965), designed in consultation with Charles Franklyn, adapted the original, depicting a rampant lion emerging from a heraldic crown and holding a spoked wheel, all enclosed in a roundel with the "British Railways" name displayed across a bar on either side. This emblem soon acquired the nickname of the "Ferret and Dartboard". A variant of the logo with the name in a circle was also used on locomotives. The zeal for modernisation in the Beeching era drove the next rebranding exercise, and BR management wished to divest the organisation of anachronistic, heraldic motifs and develop a corporate identity to rival that of London Transport. BR's design panel set up a working party led by Milner Gray of the Design Research Unit. They drew up a Corporate Identity Manual which established a coherent brand and design standard for the whole organisation, specifying Rail Blue and pearl grey as the standard colour scheme for all rolling stock; Rail Alphabet as the standard corporate typeface, designed by Jock Kinneir and Margaret Calvert; and introducing the now-iconic Corporate Identity Symbol of the "Double Arrow" logo. Designed by Gerald Barney (also of the DRU), this arrow device was formed of two interlocked arrows across two parallel lines, symbolising a double track railway. It was likened to a bolt of lightning or barbed wire, and also acquired a nickname: "the arrow of indecision". A mirror image of the double arrow was used on the port side of BR-owned Sealink ferry funnels. The new BR corporate identity and Double Arrow were rolled out in 1965, and the brand name of the organisation was truncated to "British Rail". The uniformity of BR branding continued until the process of sectorisation was introduced in the 1980s. Certain BR operations such as Inter-City, Network SouthEast or Railfreight began to adopt their own identities, introducing logos and colour schemes which were essentially variants of the British Rail brand. Eventually, as sectorisation developed into a prelude to privatisation, the unified British Rail brand disappeared, with the notable exception of the Double Arrow symbol, which has survived to this day and serves as a generic trademark to denote railway services across Great Britain. The BR Corporate Identity Manual is noted as a piece of British design history and there are plans for it to be re-published. 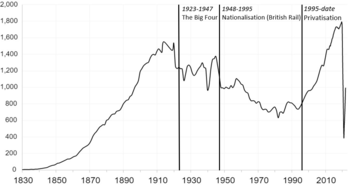 Despite its nationalisation in 1947 "as one of the 'commanding heights' of the economy", according to some sources British Rail was not profitable for most (if not all) of its history. Newspapers reported that as recently as the 1990s, public rail subsidy was counted as profit; as early as 1961, British Railways were losing £300,000 a day. It was thought that most of the nationalised railways (excluding some freight services) would cease to operate like other unprofitable privatised businesses in the UK, and British Rail's profitability was questioned. Although the company was considered the sole public-transport option in many rural areas, the Beeching cuts made buses the only public transport available in some rural areas. Despite increases in traffic congestion and automotive fuel prices beginning to rise in the 1990s, British Rail remained unprofitable. Following sectorisation, InterCity became profitable. This sector became the first long distance passenger railway in the UK to go into profit. InterCity became one of Britain's top 150 companies with civilised city centre to city centre travel across the nation from Aberdeen and Inverness in the north to Poole and Penzance in the south. In the Southwest, the line from Bournemouth to Weymouth was electrified along with other infill 750 V DC 3rd rail electrification in the south. In 1988, the line to Aberdare was reopened. A British Rail advertisement ("Britain's Railway", directed by Hugh Hudson) featured some of the best known railway structures in Britain, including the Forth Rail Bridge, Royal Albert Bridge, Glenfinnan Viaduct and London Paddington station. London Liverpool Street station was rebuilt, opened by Queen Elizabeth II, and a new station was constructed at Stansted Airport in 1991. The following year, the Maesteg Line was reopened. In 1988, the Windsor Link Line, Greater Manchester was constructed and has proven to be an important piece of infrastructure. In 1989, the narrow-gauge Vale of Rheidol Railway was preserved, becoming the first part of British Rail to be privatised. Between 1994 and 1997, British Rail was privatised. Ownership of the track and infrastructure passed to Railtrack on 1 April 1994. Passenger operations were later franchised to 25 private-sector operators and the freight services were sold to six companies, five of whom were owned by the same buyer. The Waterloo & City line was part of Network SouthEast. The Waterloo & City line, part of BR Network SouthEast, was not included in the privatisation and was transferred to London Underground in December 1994. The remaining obligations of British Rail were transferred to BRB (Residuary) Limited. The privatisation, proposed by the Conservative government in 1992, was opposed by the Labour Party and the rail unions. Although Labour initially proposed to reverse privatisation, the New Labour manifesto of 1997 instead opposed Conservative plans to privatise the London Underground. Rail unions have historically opposed privatisation, but former Associated Society of Locomotive Engineers and Firemen general secretary Lew Adams moved to work for Virgin Trains, and said on a 2004 radio phone-in programme: "All the time it was in the public sector, all we got were cuts, cuts, cuts. And today there are more members in the trade union, more train drivers, and more trains running. The reality is that it worked, we’ve protected jobs, and we got more jobs." The former BR network, with the trunk routes of the West Coast Main Line, East Coast Main Line, Great Western Main Line, Great Eastern Main Line and Midland Main Line, and other lines. The narrow-gauge Vale of Rheidol Railway in Ceredigion, Wales became part of British Railways at nationalisation. Although built as a working railway, in 1948 the line was principally a tourist attraction. British Rail operated the line using steam locomotives, long after the withdrawal of standard-gauge steam. The line's three steam locomotives were the only ones to receive TOPS serial numbers and be painted in BR Rail Blue livery with the double arrow logo. The Vale of Rheidol Railway was privatised in 1989 and continues to operate as a private heritage railway. Other preserved lines, or heritage railways, have reopened lines previously closed by British Rail. These range from picturesque rural branch lines like the Keighley and Worth Valley Railway to sections of mainline such as the Great Central Railway. Many have links to the National Rail network, both at station interchanges, for example the Severn Valley Railway between Kidderminster and Kidderminster Town, and physical rail connections like the Watercress Line at Alton. Although most are operated solely as leisure amenities some also provide educational resources, and a few have ambitions to restore commercial services over routes abandoned by the nationalised industry. British Railways operated ships from its formation in 1948 on several routes. Many ships were acquired on nationalisation, and others were built for operation by British Railways or its later subsidiary, Sealink. Those ships capable of carrying rail vehicles were classed under TOPS as Class 99. Sealink was a ferry company based in the United Kingdom from 1970 to 1984, operating services to France, Belgium, the Netherlands, Channel Islands, Isle of Wight and Ireland. The joint hovercraft services of British Rail (under British Rail Hovercraft Limited) in association with the French SNCF. British Rail Hovercraft Limited was established in 1965, under authority given to it by the British Railways Act 1967 and started its first service in 1966. Seaspeed started cross-Channel services from Dover, England to Calais and Boulogne-sur-Mer, France using SR-N4 hovercraft in August 1968. A family of railway carriages, designed and built by British Rail workshops (from 1969 British Rail Engineering Limited) (BREL) between 1964 and 1975. They were of steel construction. Many remain in service to this day. The Advanced Passenger Train (APT) was an experimental tilting high speed train developed by British Rail during the 1970s and early 1980s, for use on the West Coast Main Line, which contained a lot of curves. Notable among numerous technical advancements was the active tilting system, which the APT pioneered and has since appeared on other designs around the world. InterCity 125 at London Paddington in 1988. The InterCity 125 was and is a High Speed Diesel train that is widely credited with saving British Rail and is usually called HST. It was introduced by British Rail in the early 1970s. Under the process of British Rail's privatisation, operations were split into more than 100 companies. The ownership and operation of the infrastructure of the railway system was taken over by Railtrack. The Telecomms infrastructure and British Rail Telecommunications was sold to Racal, which in turn was sold to Global Crossing and merged with Thales Group. The rolling stock was transferred to three private ROSCOs (rolling stock companies). Passenger services were divided into 25 operating companies, which were let on a franchise basis for a set period, whilst goods services were sold off completely. Dozens of smaller engineering and maintenance companies were also created and sold off. British Rail's passenger services came to an end upon the franchising of ScotRail; the final train that the company operated was a Railfreight Distribution goods train in autumn 1997. The British Railways Board continued in existence as a corporation until early 2001, when it was replaced with the Strategic Rail Authority. Great North Eastern Railway—superseded in 2007 by National Express East Coast, brought back into public ownership with the creation of the new government-controlled East Coast operator; the East Coast franchise was transferred to Virgin Trains East Coast in 2015 who had their franchise terminated 5 years early in 2018, and the East Coast Mainline was brought back into public ownership with the creation of the new government-controlled London North Eastern Railway. Since privatisation, many groups have campaigned for the renationalisation of British Rail, most notably 'Bring Back British Rail'. Various interested parties also have views on the privatisation of British Rail. The renationalisation of the railways of Britain continues to have popular support. Polls in 2012 and 2013 showed 70% and 66% support for renationalisation respectively. Due to rail franchises lasting sometimes over a decade, full renationalisation would take years unless compensation was paid to terminate contracts early. When the infrastructure owning company Railtrack ceased trading in 2002, the Labour government set up the not-for-dividend company Network Rail to take over the duties rather than renationalise this part of the network. However, in September 2014, Network Rail was reclassified as a central government body, adding around £34 billion to public sector net debt. This reclassification had been requested by the Office for Budget Responsibility to comply with pan-European accounting standard ESA10. Under Jeremy Corbyn, the Labour Party has pledged to gradually renationalise British Rail franchises if elected, as and when their private contracts expire, creating a "People's Railway". In 1989, the ITV Sketch Show Spitting Image made a parody of Hudson's British Rail advert on the plans of the Conservative British Government to privatise the railways featuring many of the show's puppets (including the show's portrayal of former Prime Minister Margaret Thatcher), numerous BR trains and landmarks and even a cardboard cutout of Thomas the Tank Engine. Jackson, Tanya (2013). "6: In Search of an Identity". British Railways: The Nation's Railway. Stroud: The History Press. ISBN 978-0-7524-9742-6. Retrieved 11 September 2015. Height, Frank; Cresswell, Roy (1979). Design for Passenger Transport. Pergamon. p. 118. ISBN 978-1-4831-5309-4. Retrieved 11 September 2015. ^ "The Arrow of Indecision". madebysix.wordpress.com. Archived from the original on 27 April 2017. Retrieved 26 April 2017. ^ Shannon, Paul. "Blue Diesel Days". Ian Allan Publishing. Archived from the original on 1 December 2008. Retrieved 16 November 2008. ^ Her Majesty's Government (2002). "The Traffic Signs Regulations and General Directions 2002 (SI 2002:3113)". Archived from the original on 19 April 2009. Retrieved 27 March 2009. ^ "The State and the Railways". Parliamentary Debates (Hansard). Hansard. 3 August 1920. col. 711–713. Archived from the original on 19 July 2009. Retrieved 14 March 2019. ^ Her Majesty's Government (1947). "Transport Act 1947". The Railways Archive. (originally published by Her Majesty's Stationery Office). Archived from the original on 13 April 2012. Retrieved 25 November 2006. ^ "The Liverpool Overhead Railway was legendary – but is it worth rebuilding? | CityMetric". www.citymetric.com. Archived from the original on 26 April 2018. Retrieved 25 April 2018. ^ Slater, John, ed. (December 1987). "Anglia Region created". Railway Magazine. Cheam: Prospect Magazines. 133 (1040): 758. ISSN 0033-8923. ^ Slater, John, ed. (July 1988). "Anglia takes over". Railway Magazine. Cheam: Prospect Magazines. 134 (1047): 426. ISSN 0033-8923. ^ British Transport Commission (1954). "Modernisation and Re-Equipment of British Rail". The Railways Archive. (Originally published by the British Transport Commission). Archived from the original on 31 October 2006. Retrieved 25 November 2006. ^ a b c Terence Richard Gourvish; N. Blake (1986). British Railways, 1948–73: a business history. Cambridge University Press. pp. 286–290. ^ "Bad railways? Blame it on the 1950s". BBC News. 16 May 2002. Archived from the original on 25 September 2018. Retrieved 25 September 2018. ^ Her Majesty's Government (1962). "Transport Act 1962". The Railways Archive. (originally published by Her Majesty's Stationery Office). Archived from the original on 19 August 2007. Retrieved 25 November 2006. ^ "nationalarchives.gov.uk". Archived from the original on 17 March 2018. Retrieved 17 March 2018. ^ British Transport Commission (1963). "The Reshaping of British Railways – Part 1: Report". The Railways Archive. (originally published by Her Majesty's Stationery Office). Archived from the original on 19 October 2010. Retrieved 25 November 2006. ^ British Transport Commission (1963). "The Reshaping of British Railways—Part 2: Maps". The Railways Archive. (originally published by Her Majesty's Stationery Office). Archived from the original on 26 October 2006. Retrieved 25 November 2006. ^ "Can Beeching be undone?". 2009. Archived from the original on 19 June 2009. Retrieved 29 January 2010. ^ Cooke, B.W.C., ed. (July 1964). "Notes and News: New fares structure". Railway Magazine. Westminster: Tothill Press. 110 (759): 592. ^ a b Thomas, David St John; Whitehouse, Patrick (1990). BR in the Eighties. Newton Abbot: David & Charles. ISBN 0-7153-9854-7. ^ Boocokc, Colin. Spotlight on BR: British Railways 1948–1998 Success or Disaster?. ISBN 978-0-906899-98-4. ^ a b Height & Cresswell 1979. ^ a b c d Jackson 2013. ^ "Is the British Rail logo a design icon?". BBC News. Archived from the original on 20 December 2015. Retrieved 20 December 2015. ^ "History of Railways in Britain". Rail.co.uk. Archived from the original on 7 December 2015. Retrieved 27 November 2015. ^ "History of the British Railway". Rail.co.uk. Archived from the original on 28 November 2015. Retrieved 27 November 2015. ^ Gourvish, T. R. (2011). British Railways 1948–73: A Business History. Cambridge University Press. ISBN 0-521-18883-0. ^ Wolmar, Christian (23 October 2011). "British Rail 'profit' figure masks doubling of subsidy". Independent. Archived from the original on 31 December 2015. Retrieved 27 November 2015. ^ Payne, Sebastian. "Fifty years on from Beeching and Britain's railways are better than ever". The Spectator. Archived from the original on 28 September 2015. Retrieved 27 November 2015. ^ Mitchell, Brian; Chambers, David; Crafts, Nicholas (August 2009). "How good was the profitability of British Railways, 1870–1912?" (PDF). University of Warwick. Archived (PDF) from the original on 8 December 2015. Retrieved 27 November 2015. ^ Welsby, John. "Railway Services for Rural Areas". Japan Railway & Transport Review (9): 12–17. Archived from the original on 3 March 2016. Retrieved 27 November 2015. ^ "The fall and rise of Britain's railways". Rail Staff News. 19 December 2013. Archived from the original on 11 November 2016. Retrieved 11 November 2016. ^ Britain's Railway Advert 16:9 HD. 31 August 2011. Archived from the original on 22 May 2015. Retrieved 26 May 2014 – via YouTube. ^ Her Majesty's Government (1903). "Railways Act 1993". The Railways Archive. (originally published by Her Majesty's Stationery Office). Archived from the original on 20 May 2006. Retrieved 26 November 2006. ^ "EWS Railway—Company History". Archived from the original on 30 September 2006. Retrieved 26 November 2006. ^ "Union boss hops on board Virgin". BBC News. 19 October 1998. Archived from the original on 31 August 2017. Retrieved 22 September 2016. ^ "Chapter 3: British Rail Hovercraft Ltd" (PDF). competition-commission.org.uk. Archived from the original (PDF) on 2 March 2005. ^ "High Speed Train marks 30 years". 4 October 2006. Archived from the original on 23 July 2018. Retrieved 23 July 2018. ^ Merrick, Jane. "Jeremy Corbyn reveals first official policy: To renationalise the railways". The Independent. Archived from the original on 24 April 2017. Retrieved 5 May 2017. ^ "Budget 2014: fears of more austerity in spite of growth". The Daily Telegraph. 19 March 2014. Archived from the original on 21 June 2014. Retrieved 20 May 2014. ^ Elgot, Jessica. "Corbyn to launch transport campaign with rail pledges". The Guardian. Archived from the original on 5 July 2017. Retrieved 5 May 2017. ^ Britain's Railway. 20 November 2009. Archived from the original on 15 April 2014. Retrieved 26 May 2014 – via YouTube. This page was last edited on 22 April 2019, at 11:28 (UTC).